Shop EZ-Fit brand sheds for high quality wood storage shed kit options. EZ-Fit offers a huge variety of styles, designs and sizes of sheds to choose from. Select from small outbuildings or playhouses all the way up to large storage buildings for tractors and everything in between! Free Shipping on all orders! 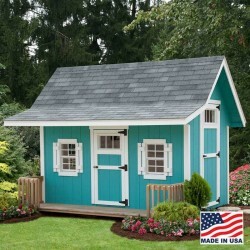 Looking for more storage space for your lawn and garden equipment, house supplies, and other items, this Cornerstone shed from EZ-Fit sheds will manage all of your storage needs.FREE Fast Shipping! Looking for more storage space for your lawn and garden equipment, house supplies, and other items, this Cornerstone shed from EZ-Fit sheds will manage all of your storage needs. FREE Fast Shipping! raditional style means the EZ-fit Homestead shed is a great choice for nearly any backyard. A double window, 30" x 36", lets in light while the double doors allow easy access for storing lawn equipment, bikes and other bulky gear. 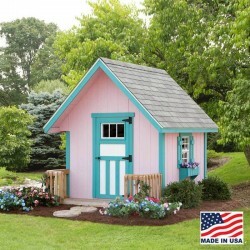 Add optional flower boxes, transom windows and a delightful weather-vane for even more style. Made in the U.S.A.